A new terminal was designed by the German company 'Dorsch und Gehrmann' (now the Dorsch Group), well known for airport infrastructure projects. The construction itself was undertaken by Cybarco (Cyprus Building & Road Construction Company). Most images on this page are courtesy of the "Press and Information Office of the Republic of Cyprus"
When the terminal was completed (at a cost of over £1m) it could accommodate 800 passengers at one time and the parking apron had space for eleven aircraft. On the 27th March 1968, the President of Cyprus, Archbishop Makarios, officially opened the new terminal building. This short video of the event includes the first Cyprus Airways flight to use the new facilities and a flyover of RAF Lightning fighters from RAF Akrotiri. A selection of interior photographs of the terminal. The building was an immediate success, acclaimed for being warm in the cooler months and cool during the long hot summers. Passengers also commented on the amount of natural light entering the building. The first Cyprus Airways flight to use the new facilities......a Vickers Viscount, leased to the airline in 1965. In 1969 the Cyprus Airways fleet was improved by the addition of the Hawker Siddeley Trident. This fast, three engined airliner allowed cities such as Frankfurt, Manchester, Brussels, and Paris to be added to the timetable. It would appear that the latest generation of airliners was not kind to the surface of the parking apron. After a few months of operation, the concrete is now heavily marked. 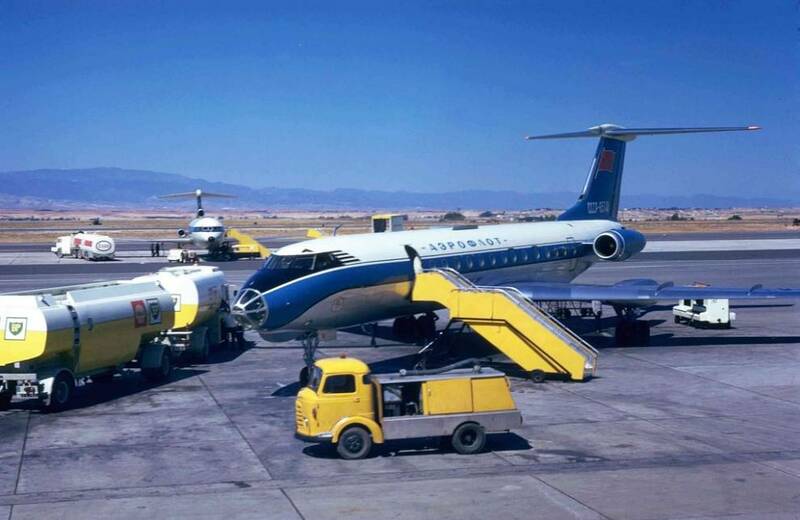 As the number of airlines using Nicosia continued to grow, passenger traffic in 1968 reached 283,000. This represented an increase of almost 100% compared to 1960 figures and the Nicosia Area Control Centre provided services to 61,783 flights. On the 7th October 1971 an Ilyushin Il-62 of the East German airline Interflug, inaugurated a new service between East Berlin and Nicosia. Another familiar sight since October 1971 is an RAF Shackleton aircraft (XF700). This particular aircraft was sent to Cyprus to be used for fire-fighting training. Once all the useful parts had been removed, it was officially scrapped in January 1972. A view of XF700 when it was based at RAF Kinloss. 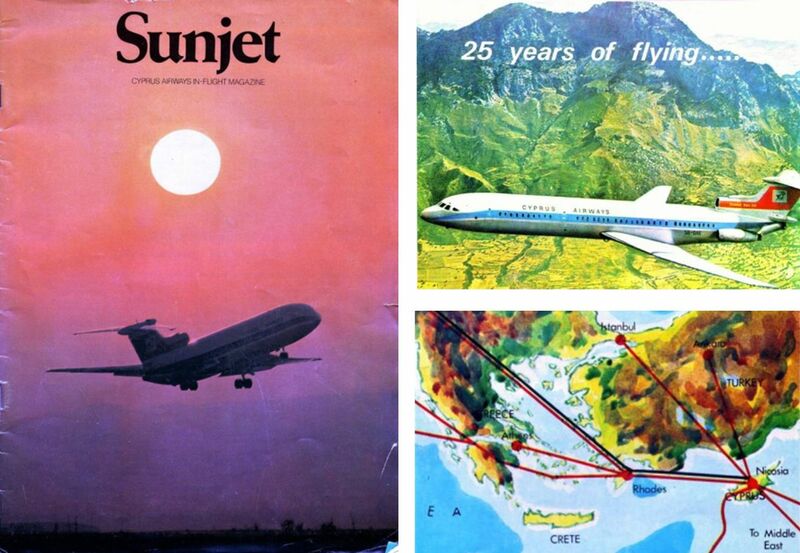 The year 1973 was greeted with great enthusiasm, it was the 25th anniversary of Cyprus Airways, passenger traffic was to reach 785,564 and the Area Control Centre would serve 81,563 flights. Sadly, this period also ended with accidents and tragedy. On the 29th January 1973 an EgyptAir Ilyushin Il-18 (SU-AOV) crashed into the Kyrenia mountain range on approach to Nicosia. The turboprop hit the mountain at an altitude of 2,569 ft (384 ft below the crest) killing its 7 crew and 30 passengers. The airliner was returning the passengers to Cyprus following a visit to Egypt. On the 29th August 1973, a Czechoslovak Airlines Tupolev Tu-104, flight CSA531 from Damascus, overran Runway 32 upon landing and slipped down the bank close to the end of the runway. Nobody was seriously injured but the airliner was written off and moved (on sets of bogies) a safe distance away from flight operations. 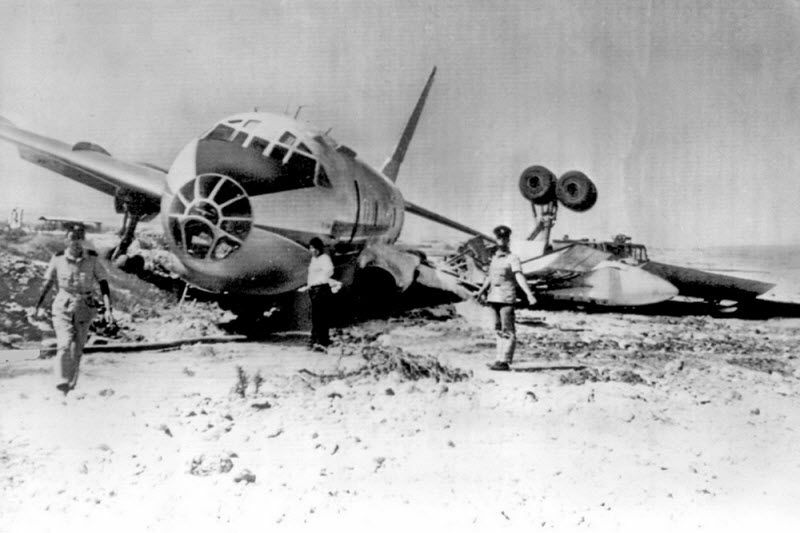 Later, the wreck was purchased to be converted into a themed restaurant but the next phase of the airport's history prevented this from happening.